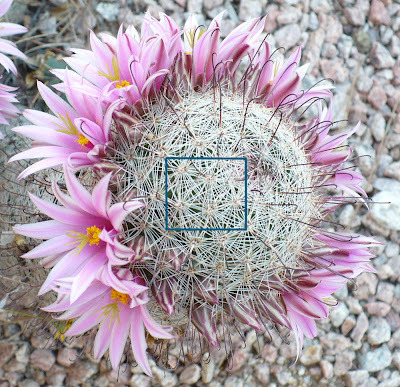 I want to demonstrate how I have created a new background for my new pincushion cactus mandala. I am offering it here, because it is a technique that has potential for widee ranging applications. I start with this photo of a pincushion cactus. Note that I have outlined a square section in blue which I cut out using PSP(Photoshop).